Practicing mindfulness doesn't have to be about sitting and breathing. One of my favorite ways to be mindful is to create and color mandalas. The word mandala means “sacred circle” in Sanskrit and these designs have been used in cultures throughout the world. They are symbols of interconnection, wholeness, and harmony. I have found that coloring mandalas with students and in groups creates an instant hush in the room. Everyone is calm, focused, and enjoying the process of creating. 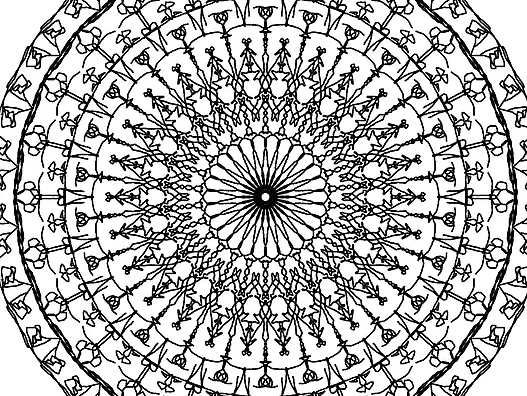 Amaziograph: if you have an iPad, this is an amazing way to make your own mandalas. You can color them in-app, or print them and color them. The mandala featured in this email is one of my own creations. Monday Mandala: this web site has nearly 100 free, intricate and printable mandala designs.